A rich and multi-faceted aspect of the Italian Renaissance, the comedy has been largely overlooked as a cultural force during the period. In Renaissance Comedy, editor Donald Beecher corrects this oversight with a collection of eleven comedies representative of the principal styles of writing that define the genre. Proceeding from early, ?erudite? imitations of Plautus and Terence to satires, sentimental plays of the middle years, and later, more experimental works, the development of Italian Renaissance comedy is here dissected in a fascinating and vivid light. This first of two volumes boasts five of the best-known plays of the period, each with its own historical and critical introduction. 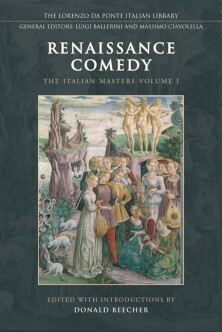 Also included is a general introduction by the editor, which discusses the features of Italian Renaissance comedy, as well as examines the stage histories of the plays and what little is known, in many cases, of the circumstances surrounding their original performances. The introduction raises questions concerning the nature of audiences, the festival occasions during which the plays were performed, and the academies which sponsored many of their creations. As a much-needed reappraisal of these comedic plays, Renaissance Comedy is an invaluable look at the performance history of the Renaissance and Italian culture in general.